In all areas of our company, we begin with high quality materials and employ skilled craftsmen to complete the work. The combination of these two factors always results in our desired outcome. We start with quality iron castings both of imported and domestic origin. 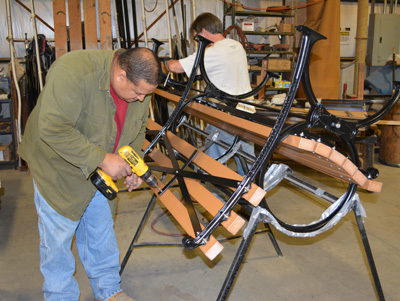 We then carefully apply a powder coat finish. Lumber species are sourced for their durability and strength, and all lumber is to be free of knots and worm holes. In preparation for use on benches the lumber is drilled, sanded, and the cut ends are beveled. Wire waste baskets are hot dipped galvanized; after galvanizing all drips and sharps are filed off by hand. Our concrete chess tables are all hand finished, removing any seams and filling surface air holes formed during the casting process. Each lead statue, ornament, and fountain is created for the specific project, and is adapted for that use during fabrication. This method allows us the greatest flexibility in customization. Lead is welded with pure lead rods. The welds are puddled deeply, and then excess material is filed back into shape. When appropriate and necessary, stainless steel or bronze reinforcing bars are included in the lead. All our other metal fabrications follow the same practices of creating a deep weld and then re-shaping the area to create a seamless design. Cast stone is prepared from molds of latex rubber, fiberglass, or wood. Each mold is prepared for the job with the required reinforcing, which is either coated steel rebar, stainless steel bars, or fiberglass rebar. 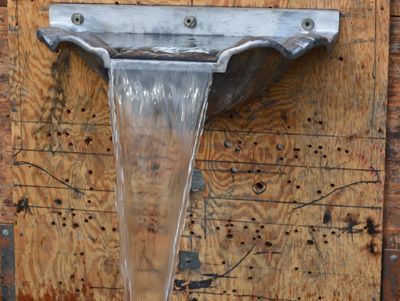 If the piece is to be plumbed, the plumbing is placed directly in the mold prior to pouring. 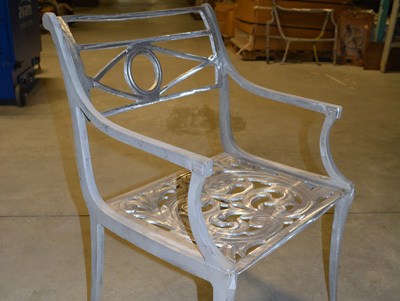 All of our exclusive patterns are cast in domestic foundries. The castings are hand detailed prior to construction. During the assembly process we carefully assess that the supports are level, and all parts are square. After the furniture is welded, all seams are smoothed to create the faultless construction we are known for. We use abrasive sanders to smooth out any residual texture from the casting process. This allows us to apply our premium glazes.